This is a transcribed and edited interview with Evan Greer, the campaign director at Fight for the Future. This interview was recorded for the NetPosi podcast at Evan’s home in Boston, Massachusetts. Drew: Tell me a little bit about yourself, Evan. Evan: I’m the campaign director at Fight For The Future which is a digital rights non-profit that works to preserve the Internet as a free and open platform for freedom of expression and social change. Which is sort of a long-winded, fancy way to say that we try to stop governments and corporations from screwing up the Internet. 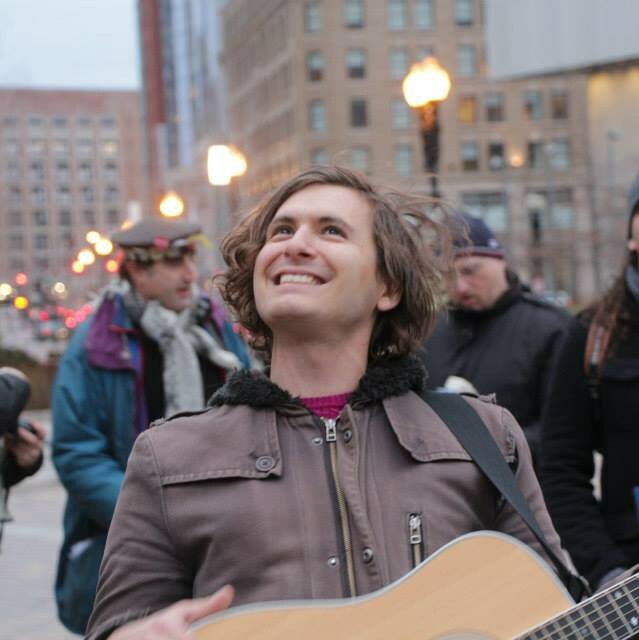 I am also a traveling musician and that’s actually kind of how I came into all this… through traveling around playing music about politics and about what I was seeing in the world, and doing workshops and trainings for other activists. Then wanting to do some full-time organizing work, it made a lot of sense for me to focus on the Internet. It was really hard to pick a single issues that I could dedicate all my time to, but it was really clear to me through traveling around and learning about all the awesome grassroots activism that was happening around the country and the world and how much of it depended on the Internet as a platform to get whatever their message was out or to organize events or to make things happen. For me, as someone who cares about a bunch of different things, it was a clear choice to jump in on trying to defend this thing that was so clearly at the center of so many peoples’ struggles and whatever they were working on. Drew: Tell me more about that. Tell me what being a traveling musician was like. Do you still tour? Evan: Yeah! I still tour a few weeks at a time over the course of a year (in the midst of campaigning and being really deeply involved in the Internet freedom movement). I dropped out of Swarthmore College and played 200 to 250 shows a year for almost 10 years. I have a 5 year old who has been to like 14 countries and 35 or 36 of the U.S. states. Being dragged around on these tours is a formative experience for any kid. The connection with all of it for me, especially when the SOPA Strikes happened, I remember as a musician being bombarded with narratives about how the Internet is killing music, the Internet is bad for independent musicians, and the Internet is bad for culture. I was experiencing the total opposite of that. My modicum of success that I was able to have as a touring musician came from being able to show up to some random town in the Czech Republic, and have dozens of people there that knew all the words to all of my songs because they downloaded it at Archive.org or something like that. Seeing the power of this platform to give a voice to the underdogs in all these different fights, struggles, music and culture. It was amazing to see the juxtaposition of that with these narratives that I was getting from like Performer Magazine and things that were like geared towards musicians and people like me that were really trying to make it or make a living doing it. Drew: What is SOPA? 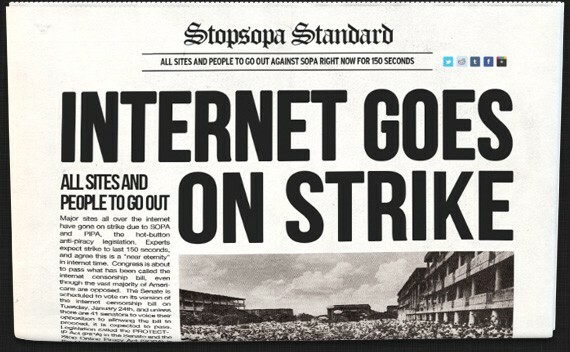 What was the SOPA Strike? And how does that relate to your music? Evan: It doesn’t particularly relate to my music, it’s more of something I remember happening in the midst of touring and playing music. It was the first time I was like, “Oh there’s Internet activists! There’s this fight over what the Internet is going to be.” Later, as I started doing this work, my history as a musician plays into that a lot because it fuels why I care about the Internet and also makes me angry at the people that try to attack and undermine our Internet freedom in my name or claiming that they’re doing it to defend musicians or defend culture or benefit the rights of working musicians. It’s something that’s really important to me, I struggled a lot to support my family as a musician. In some ways, I did better than many people who tried really hard but in the end it just wasn’t enough to totally support my family which is part of the reason why I moved toward doing campaigning. sI think there needs to be real conversations that musicians and all creators of culture have about how to adapt to the Internet and how to figure out what the new ways are that people are going to be able to create culture in this world and support themselves doing that. The Internet is totally the best thing that ever happened to any of that, we just have to figure out how to do it right and that’s happening. It’s exciting. Drew: Fight For The Future has made a name for itself very quickly through Internet campaigning. Tell me a little bit about your recent campaigns or projects that you’ve been proud of. Evan: What’s exciting to us is that the Internet gives us the ability to respond to things super quickly. A lot of what we do is seeing what’s happening and seeing where there’s a conversation that tons of people are having and how we can figure out how to join the conversation and engage people in a discussion about what they can actually do about the problems that they see. Then, we give them tools that make it super fast and easy for them to do it. 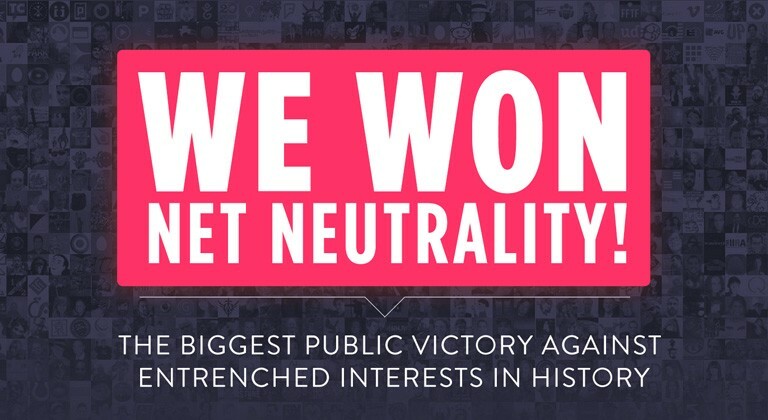 Our big victory and campaign over the past year was about Net Neutrality, which is the basic principle that all Internet traffic should be treated equally — that big Internet companies shouldn’t be allowed to discriminate, slow down, or block content. You should be able to access everything on the Internet that is legal and open, without companies or government getting in the way. What we saw was that so many people cared so deeply about the Internet and felt that it was such an important part of their lives. We were able to fight for more than just a policy change, but a cultural change. That’s what was really exciting about the Net Neutrality victory. There have been several attacks on it since we won the policy that is protecting us now, but I think what we’ve seen is that we’ve shifted culture enough, we’ve shifted public opinion enough that companies are pretty nervous to unleash that type of wrath again. They’re dancing around the issue or trying to find sneaky ways to get around it, but it’s no longer cool for them to be seen as attacking Net Neutrality and they know it. That’s a pretty major victory because policy victories are short lived, or they last as long as the current administration or the current state of affairs in Washington D.C. or elsewhere, but culture shift victories become baked into society. We can see the major changes in attitudes from LGBT issues over the past decades — and we have so much further to go — but the culture work that goes into that is going to have a much greater impact than actually winning gay marriage. The same is true when we talked about Internet policy or anything else. The victories that we’re really winning are how we’re affecting the narrative. Over the course of the Net Neutrality fight we’ve grown a huge list of supporters, more than 1.4 million people who are taking action on campaigns. It’s exciting to see people coming to us and saying, “We’ve learned about this thing, it’s really bad and you need to do something about it.” And being able to jump in and quickly respond. Another example that’s been really important to me over the past year, is that I’ve been talking to Chelsea Manning, who’s the Wikileaks whistleblower that’s serving a 35 year sentence for exposing some of the U.S. governments’ worst abuses in Iraq and Afghanistan. When we learned that she was facing potentially indefinite solitary confinement for some extremely minor prison infractions, like having a copy of the Vanity Fair issues with Caitlyn Jenner on the cover, or having a copy of Cosmopolitan that Chelsea herself is interviewed in, or other basic reading materials, or having a tube of expired toothpaste in her cell… We managed to launch a petition with several other organizations and we got 100,000 signatures, we put a big banner in front of the pentagon, and quickly the military moved to give her very minor disciplinary measures, like no rec. time, and she didn’t get a single day of solitary confinement. She totally credited this to the effort of activists. I’ve supported a bunch of different political prisoners over the years and it was amazing to see the level that we’re at now with the Internet to impact a prisoner and support them quickly to avoid something so drastic. The ability to get 100,000 to speak out on something practically overnight is game changing and that’s been really exciting to see. Drew: How do you do that? How do you get 100,000 people to take action on something like that? Evan: So much of it is about framing. It’s not necessarily just about what we’re talking about; it’s about how we’re talking about it. That’s really what we at Fight For The Future are trying to perfect, and we’re still very much students of the Internet. The Internet is teaching us about this. You can see how things spread across the Internet, if you just sit there and watch it. Sometimes it’s amazing to note. It’s like, okay, “Every news agency is talking about the same breaking news story, but I keep seeing the same news article popping up in my feed.” That’s because that article had the best headline! We need to figure out how to talk to people about things in ways that they: A. Want to hear about it & B. Are then engaged in it & C. Then want to tell other people about it. So much of what I do becomes about testing messages. That can range from talking to my neighbor who’s just a totally average frat-bro and asking him if certain things make sense. Or it can mean sending an email to 50,000 people one way and to 50,000 other people another way, and then measuring which one actually did better. That doesn’t just tell us how to raise more money, or get more clicks, signatures, or phone-calls. It tells us how to talk to people about things, and how to engage society in a conversation about how it can change or where it could go. That’s what’s exciting to me with the campaigns that we run. It’s exciting to me to make policy victories and we have a bunch under our belt, either stopping bad pieces of legislation or getting progressive policies that get peoples’ right protected passed. To me, the crux of it is affecting the narrative and getting people to actually change the way they think about things, particularly the way they think about the Internet and feeling like it’s something they want to fight for and to defend. Drew: So whistleblowers, privacy, piracy, political prisoners, LGBT issues, Internet issues… What ties all this together? Evan: The new generation who identify as “Internet activists”, in other words people who are growing up as activists in the Internet age, have a fundamental distrust of authority. The counter to that is a vehement belief in freedom of speech and freedom of expression. Supporting political prisoners: it’s not always whether I agree with their exact politics (we may have disagreements), it’s about feeling that they had a right to challenge authority in the way that they did and should be respected. 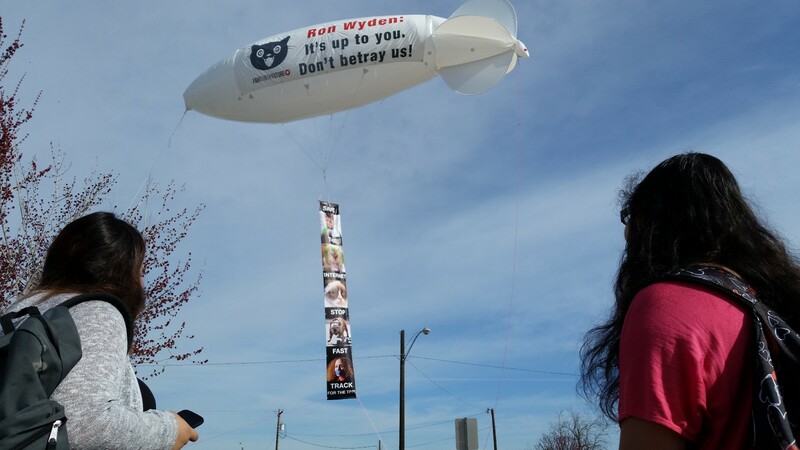 Supporting whistleblowers: I feel that they have a right to expose abuse the way that they did and deserve dignity and support. Fighting for the Internet: it’s about protecting peoples’ abilities to have that megaphone so that average voices can cut through and be meaningful and have impact. All of it ties together as an eternal battle between authoritarian structures and popular freedom. Free speech is the wedge that makes that battle winnable. Drew: Who’s the enemy? Who particularly do you see as the enemy of a free and open Web? Evan: There’s a few big enemies. 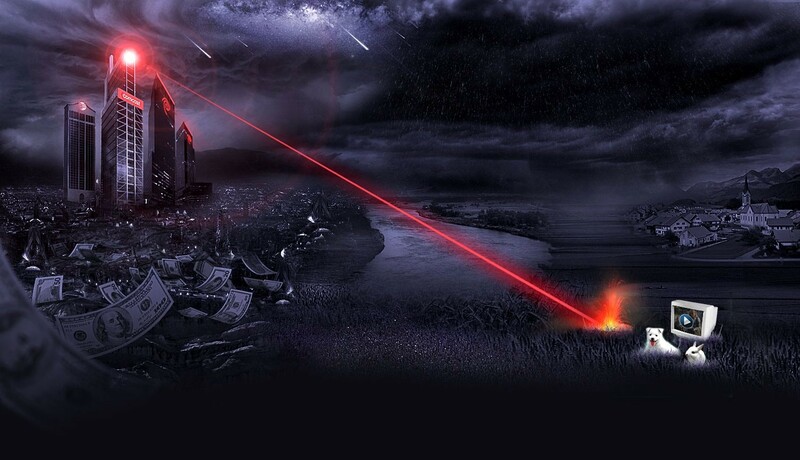 There’s incumbent industries that don’t want to adapt to the reality of the Internet. Hollywood and the movie industry. And to a large extent, the Internet companies themselves; Comcast, Verizon, AT&T. Companies that have been around for awhile and have figured out a really good way of making a profit; they have near-monopolies on their markets. They’ve divided up the country into local monopolies that prevent them from competing with each other so they can all keep their prices high. All of these companies have a huge vested interest in keeping things as they are, preventing additional protection for Internet users’ rights. They are continually pushing the Internet toward being a platform that’s primarily designed to build profit for these companies as opposed to being this cool, awesome, wonderful, weird thing that we all love. The other major enemy is government and political institutions that see the Internet as threatening their monopoly on information and their ability to spread information through homogenous news networks. It’s much easier to control a population when you can control what kind of information they can receive. The Internet has blown that up over the past several decades. Governments are always trying to figure out how to lock it down, control it more, respond to the reality that it undermines their ability to conduct their business in secret or to prevent their citizens from understanding what’s really going on. Often, these two major enemies work in concert. One thing that’s interesting is the Libertarian critiques of Net Neutrality saying that government shouldn’t be interfering with these corporations’ abilities to cut deals and make money. 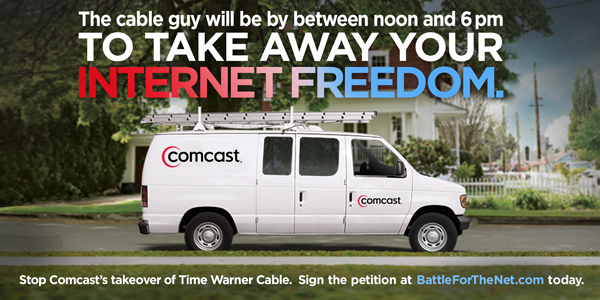 It ignores the reality that the line between Comcast and the Democratic Party can get pretty blurry sometimes. A lot of these companies have a revolving door with the regulatory agencies that are supposed to be regulating them. That door goes both ways. If you’re concerned about the government stopping corporations from making profits, you should also be concerned about the government going to corporations and telling them to slow down particular content or blocking something. The closer that relationship gets, the worse it is for Internet users. In some ways the enemies look different, and you can see a partisan divide around who you pick as the entity that you’re gonna blame whether that be the government or corporations, but in reality, it’s fear, greed, and authoritarianism. Corporations and government can exhibit all of those things so we need to be wary of it. Drew: How do we fight them? Evan: We need to use all of the tools in the toolbox. We need to be really creative. We need to find ways to mobilize massive numbers of people who are willing to do more than just click on a petition or make a phone-call. 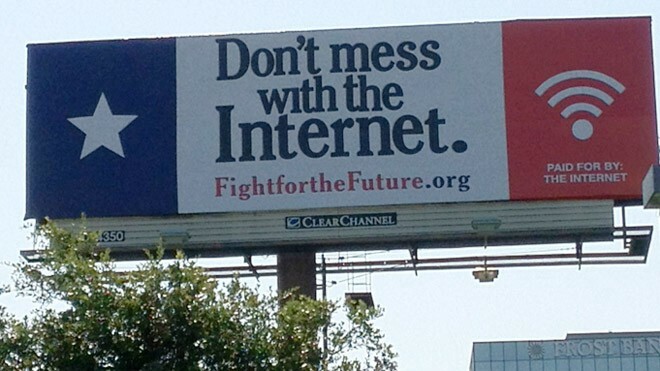 In the end it requires making it politically costly to mess with the Internet. That’s something that we’ve been pretty successfully doing over the years. While there are attacks on our Internet rights, now the government always has to dress them up and try to make it seem like that’s not what they’re doing. 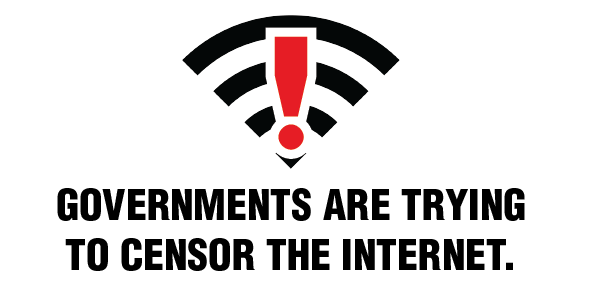 It’s no longer cool to be seen as supporting anything that looks like Internet censorship or expanded Internet surveillance, particularly the companies are extremely concerned about appearing to be in any kind of cahoots with the government around that. That’s what’s really the victory we need to keep defending. We’ve shifted things to the point that the Internet is seen as the thing to defend and support. Now we just need to make sure that we win the narrative over how to do that and don’t allow the Internet’s enemies to use that narrative against us which they are trying to do. 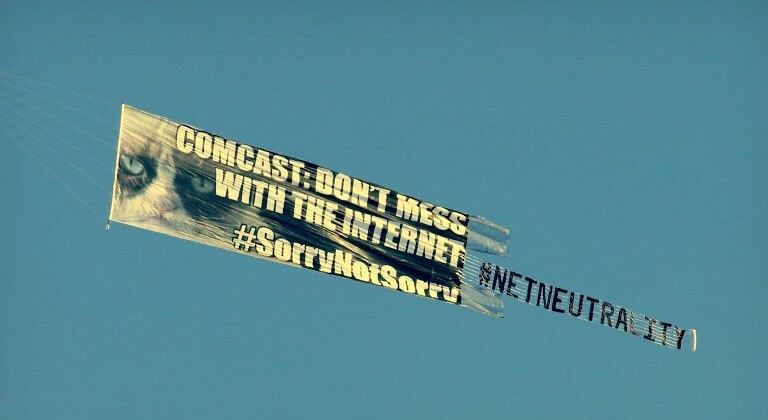 The reality is that we’ve already kind of won that war, they can’t come at us anymore saying that they don’t want Net Neutrality, they have to say that their Net Neutrality is better than our Net Neutrality. Their already losing ground when they have to start the debate there. Beyond that, we need more people using the Internet as a platform. We need to support the development of more organizations’ abilities to use it effectively. That’s one thing myself and Fight For The Future are excited about. We’re learning a lot of things as a young organization trying to do this and our goal is to share them. It would be so awesome if there was a Fight For The Future organization working on prison justice issues or the drug war. We’d love to support the ability of other groups to have the support technology in some of the ways that we have. That’s starting to happen; there’s trainings and different things going on. In some ways, other movements are doing it in better ways than we are. 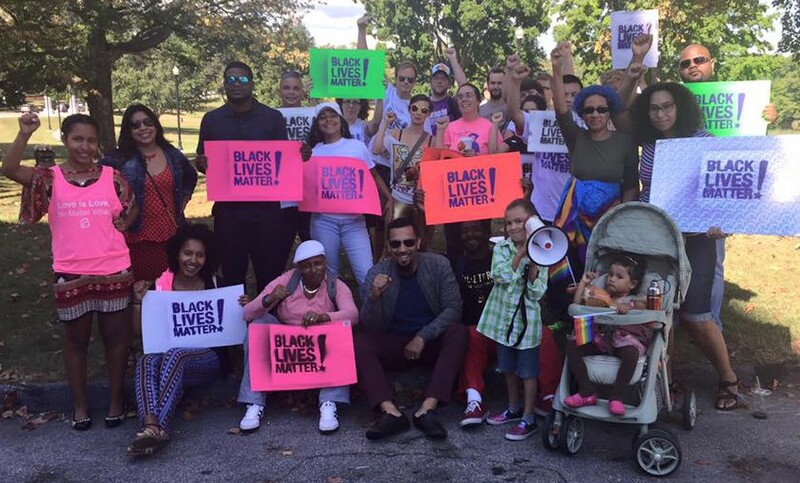 Black Lives Matter has been an amazing example of online/offline organizing coming together and the Internet being an essential part of it, but also not the only piece of it. We stand to learn a lot from that as an Internet freedom movement. Overall, we need more people thinking hard of how we use the Internet effectively and recognizing that we can’t just keep recreating the same things. We get dozens of emails from people a week asking when we’re going to organize the next blackout to stop the next bad Internet thing. The reality is we’re probably never going to do that exact same thing again. We have to keep getting creative; the Internet keeps giving us endless possibilities, but we need more training and support for activists across the board to use technology and think about it in terms to achieve their goals. We’re not just thinking about how to get more followers or more donations, it should be about how to get more power, affect change, or change our organization’s long & short term goals. It’s exciting to think about where things will go in the next 10 years and seeing where they’ve come in the past 10 years with the Internet’s ability to amplify activism. Who knows what’ll happen next. Drew: Looking forward, are there any particular projects, campaigns, or organizations over the next 6 months, next year, next 10 years that you’re excited about? That you’re looking forward to helping develop? Evan: Our next major campaign at Fight For The Future is around the Trans Pacific Partnership. It’s a massive trade agreement similar to NAFTA that contains a wide-reaching range of policy tweaks. Our Internet concerns related to it revolve around the intellectual property chapter which exports the U.S.’s worst copyright policies on the rest of the world without any protections for freedom of speech or expression. It basically protects the rights of giant companies and not the rights of average Internet users. We are gearing up for a major campaign that will essentially be a roadshow to 12 strategic cities where there are lawmakers that need to be pressured on this issue. The TPP is not inevitable. Obama is expected to sign it early next month, but Congress has to vote on it for it to actually go into effect. There's actually a very real chance that we can stop it in Congress; it’s deeply divisive, faces resistance from both left and right, and there’s a good chance that we can stop this vote. One of those opportunities that the Internet gives us to kind of “hack politics” and actually stop something even though the Chamber of Commerce, Walmart and every major company in the world wants it because it’s a wish list for everything they couldn’t get past in Congress or through any other transparent means. So we’re organizing this major roadshow with celebrity musicians, speakers, and activist trainers who will provide support for local activists that are working on TPP actions in their cities. We’ll go around to major cities and put on big rally events and then use them to ignite online action, like a telethon as well. People will be calling in and we’ll be applying strategic pressure on lawmakers so that we can stop this vote in the end. That’s something that people all over will be able to get involved in because there’ll be online components as well as being able to show up in the cities. We’re also trying to open source the process as much as possible so that there’ll be tasks online for people to do. 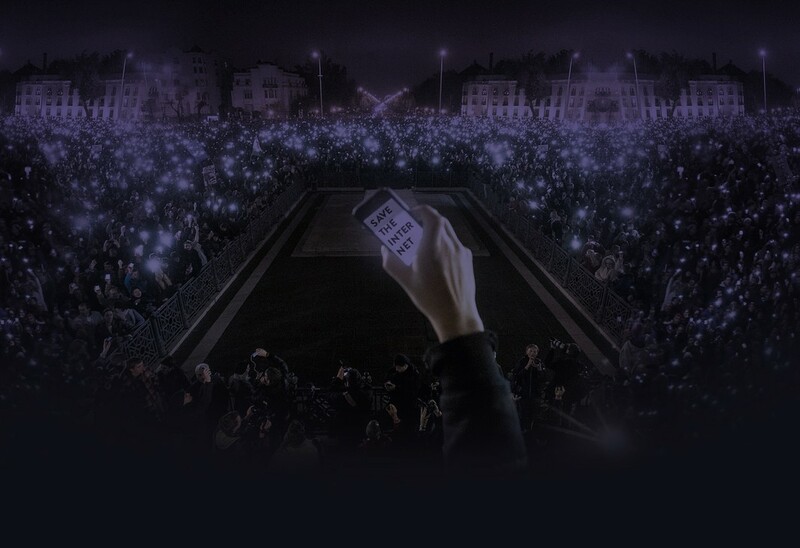 That’s an exciting ability again to use the Internet to organize mass events that may traditionally only have been possible with the support of major corporations or some kind of other institutional backing. In this case we’re actually gonna be able to do it just with support from the Internet. Other major campaigns that I’m paying attention to: Chelsea Manning is going to have an appeal and that’s something that everyone should be paying attention to and Fight For The Future will definitely be tracking. The other big fight that is gonna unfold over the next year is encryption. We’re already seeing a huge amount of debate and politicking on this, but basically governments, ever since the existence of strong encryption technology, have been selectively saying that it’s terrible whenever people that they don’t like are using it, and wonderful when people that they do like are using it. We’re now coming to a point where it seems like many governments are very interested in forcing tech companies to put backdoors into encryption, which is extremely dangerous not only for our privacy and human rights, but also even just strictly from a security perspective. Even if you totally believe that the US government is always right all of the time and they are the good guys and they will only use this backdoor to catch horrible people who are trying to murder millions, the reality is that once you put a backdoor into technology anyone who finds it can use it. If you believe the NSA is only going to use it for good things, then you have to be concerned about other governments, corporations, or just any random hacker anywhere in the world who decides to exploit that vulnerability once its discovered. That’s going to be a huge fight over the next year. We’re approaching it from a little tongue-in-cheek perspective to begin with. We just saying, “You can’t ban math”. Encryption is simple math. Maybe we need math teachers everywhere to rise and say, “You can’t ban math”. There’s got to be a culture war over the next year around privacy and civil liberties and it’s going to heavily focus on this question of protecting strong encryption technology — the basic technology that protects the security of airports, hospitals and our phones and everything else that we use on a daily basis. If we allow governments to punch a hole in it, that endangers millions of people. Drew: Any resources or shoutouts? To learn more about the TPP, you can head to FightTheTPP.org, which is a growing coalition site that brings together labor and tech companies and environmental groups to show the wide range of opposition to this agreement. 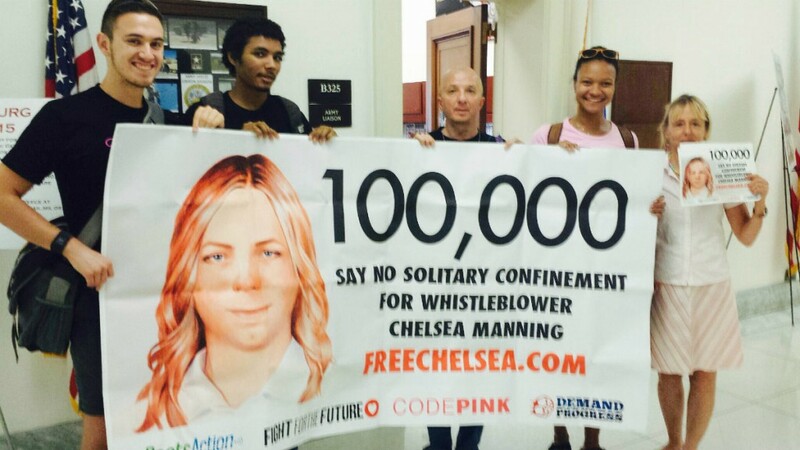 To learn more about Chelsea Manning and to support her, head to ChelseaManning.org. That’s the Chelsea Manning support network, they’ve been doing great work supporting her inside. Especially important right now is raising funds to support her appeal. She can also get letters, which is a great way to support anyone who is locked behind bars. Around this encryption stuff, I recommend the EFF, the Free Software Foundation, Bruce Schneier is writing a ton of great stuff. Over the coming months and week, Fight for the Future and other groups will be launching major campaigns focused on legislation in the UK, focused on things here in the US. You can find us at FightfortheFuture.org and twitter and all the other places. We always try to figure out what would we do if we could get 100,000 people to do something. Then we try to figure out how can we make that as easy-to-do as signing a petition? The goal is to figure out what can we actually do to affect change and we try to figure out how to give people an opportunity to do that. This interview is originally from NetPosi, a podcast about activism and technology. The best way to find out about future episodes is to join the email list. You can also subscribe using iTunes or follow the show on Soundcloud.